More than 1000 people read my blog last month. That could be good or it could be bad. It’s good if people are reading my ramblings and are closing out of their browsers wanting to be more like Christ. Or, it could be bad if it means there are 1000 people with nothing better to do than read this thing. 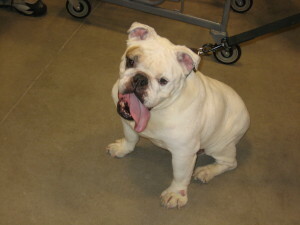 I just came across an English Bulldog named Rocky who is in a bulldog rescue. Rocky is 8 years old and a happy-go-lucky guy but he’s worthless. He’s only going to live maybe 4 more years and he has some skin issues. So, nobody wants Rocky. He’s too much work. I’d take Rocky in a second. Rocky needs someone to rescue him in Connecticut. He needs someone who sees value in him and will welcome him and love him regardless of all his issues. (www.PetFinder.com). His rescuer will need to patiently and firmly teach him some new habits. Rocky and I have a lot in common in that we’re both asthmatics with bad gas and allergies to exercise, but I have a Rescuer who is patiently and lovingly helping me reach my potential. My Rescuer knows my issues and gives me shelter. My Rescuer knows what makes me growl. He knows when I need rest. He knows what makes me jump up and take notice. He knows where I’m tempted and knows what makes me smile. And, as odd as it sounds, He knows when I need a good belly-rub. With Him, it’s not about what I can offer or what I can do. He just likes to have me hanging around and sharing my days with Him. I’m a little less of a mess than I was 100 posts ago. That’s the way it is with The Rescuer. It’s a walk more than a race. This entry was posted in Christianity and tagged authenticity, hope, Jesus, rescue, salvation. Bookmark the permalink.